Visit NRS's Rescue Wetsuit page. 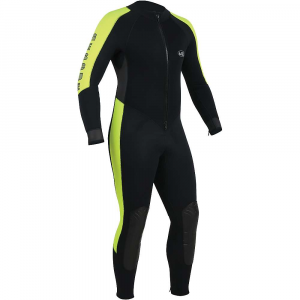 NRS Rescue Neoprene Kayak Wetsuit - A full-coverage wetsuit designed specifically for rescue crews, the NRS Rescue Wetsuit provides the highest level of insulation while retaining mobility. 3-mm neoprene with Titanium gives you superior heat retention and protection from the cold while Power Span panels in the shoulders, back and arms greatly increase mobility and reduce binding. A full-length double-pull YKK front zipper along with wrist and ankle zippers make the Rescue Suit easy to get in and out of. Glued and blind-stitched seams maximize warmth and comfort against your skin. Molded polyurethane knees and shins provide long wear and extra protection. The 5-mm neoprene seat provides extra padding and is covered with Tough-Tex for increased durability. Textured raw neoprene friction zones on the sides help lock a PFD in place. The Rescue Suit also has reflective lettering and bright yellow panels increase visibility. 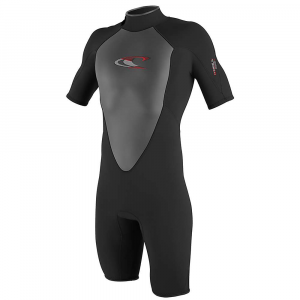 When its time to go in, do so with confidence in the NRS Rescue Neoprene Kayak Wetsuit. 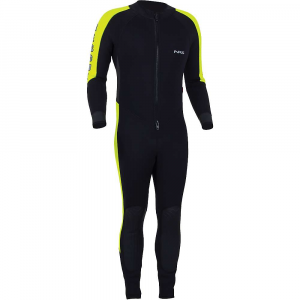 A full-coverage wetsuit designed specifically for rescue crews. 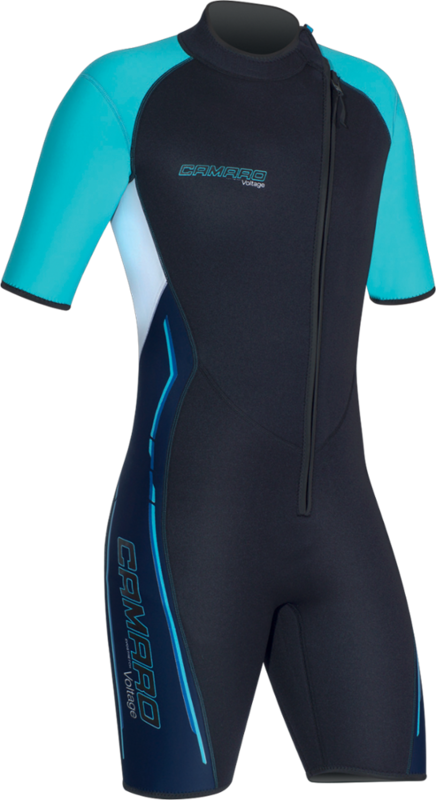 The NRS Rescue Wetsuit provides our highest level of insulation, while retaining mobility. . This product ships directly from NRS and will leave their warehouse in 2-3 business days. Eligible for UPS ground shipping only. . . . 3-mm neoprene with Titanium gives you superior heat retention and protection from the cold. . 3-mm PowerSpan(TM) neoprene panels in the shoulders, back and arms greatly increases mobility and reduces binding. . Full length double-pull YKK(R) front zipper along with wrist and ankle zippers make this suit easy to get in and out of. . Glued and blind-stitched seams for maximum warmth and comfort against your skin. . Molded polyurethane knees and shins provide long wear and extra protection. . The 5-mm neoprene seat provides extra padding and it's covered with ToughTex(TM) for increased durability. . Textured raw neoprene friction zones on the sides help lock a PFD in place. . Reflective lettering and bright yellow panels increase visibility. .
With features designed specifically for rescue crews, the NRS Rescue Wetsuit provides our highest level of insulation, while retaining the mobility you need to do your work. 3-mm neoprene with Titanium gives you superior heat retention and protection from the cold. 3-mm PowerSpan(TM) neoprene panels in the shoulders, back and arms greatly increases mobility and reduces binding. Full length double-pull YKKA(R) front zipper along with wrist and ankle zippers make this suit easy to get in and out of. We've glued and blind-stitched the seams for maximum warmth and comfort against your skin. Molded polyurethane knees and shins provide long wear and extra protection. The 5-mm neoprene seat provides extra padding and it's covered with ToughTex(TM) for increased durability. Textured raw neoprene friction zones on the sides help lock a PFD in place. Reflective lettering and bright yellow panels increase visibility.